Pioneers in the industry, we offer general aux electric blanket waterproof bed warmer, general aux surya ojas 0101 led lantern portable, general aux infinity vivo collection ap01 air fryer with rap, general aux 12 l bake it easy pluto 1000w otg microwave oven, electric blanket warmer and air fryer from India. This Electric Blanket Will Heat Up In A Swift 10 Minutes. Electric Bed Warmers Reduce Your Electricity Bill To A Fraction. It Gets Warm In Few Minutes. Controllable Speed Low, High. Can Also Off The Blanket From Controller Comes With Dual Safety Features. Plug In The Electric Blanket. Most Of The Newer Models Have Long Cords To Allow You To Use Them In Any Situation. Turn Down Your Furnace And Use Less Energy. 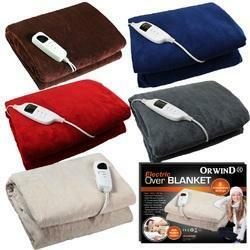 Keeping Your Bed Warm With A Low Voltage Blanket Allows You A Great Deal Of Savings On The Heat At Night. Electric Bed Warmer is placed under the bed sheet. It radiates heat from beneath inducing deep restful sleep even in the coldest of winter nights. At the same time, the heat therapy relaxes the tired back and legs muscles. It helps ease stiffness and soreness and allows you to wake up feeling rested and fresh. 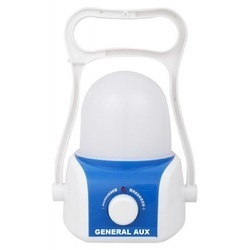 General Aux Company Electric Bed Warmers are time tested, safe and comfortable. No more wrestling with heavy electric blankets that keeps sliding off. No more laundry worries. No more cold winter nights. General Aux Company Electric Bed Warmer is held securely on the mattress, under the bed sheet. This keeps it protected from dust, adding years to its life. General Aux Company Electric Bed Warmers reduce your electricity bill to a fraction. You would no longer need the heat pillars / radiators that not only increase your electricity bill but also harm your respiratory system by reducing the moisture level in your room. Double Safety Feature - Power Consumption: 70 Watts - 1 year warranty against any manufacturing defects - Saves Electricity as compared to room heaters and blowers - Recommended by doctors. 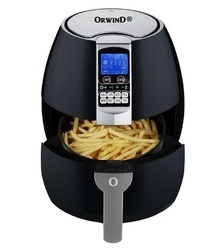 From the ManufacturerGreat Tasting Fries With Up To 80% Less Fat!With Rapid Air technology for the Perfect ResultsGeneral Aux unique Rapid Air Technology lets you fry with air to make food that is crispy on the outside and tender on the inside. Little or no oil is needed to ensure perfect texture and delicious results! Rapid Air Technology for Healthier Frying: Airfryer's unique Rapid Air technology enables you to fry, bake, roast and grill, the tastiest snacks and meals with less fat than a conventional fryer, by using little or no oil! General Aux Airfryer with Rapid Air technology also creates less smell than conventional fryers, it is easy to clean, safe and economical for your daily use! Unique Design For Delicious and Low-oil Cooking Results: General Aux Airfryer's unique design which combines fast circulating superheated air, starfish design and optimal heating profile allows you to fry a variety of delicious meals in a fast, easy and healthier way without necessarily adding oil. With the Airfryer You Can Fry, Grill, Roast and Even Bake: Not just great for frying, the innovative General Aux Airfryer with Rapid Air technology also lets you grill, bake and even roast your favorite dishes for a one stop solution for all of your meals. Fast and Easy: Large cooking capacity for all your favourite recipes.Recipe book created by culinary experts gives inspiration for a variety of low-fat fried food that you can cook in the Airfryer. It also introduces you to recipes that showcase the versatility of the appliance so that you can grill, bake and even roast food healthier, faster and more conveniently. Adjustable Time and Temperature Control: Its integrated timer allows you to pre-set cooking times of up to 30 minutes. The auto-off function includes a "ready" sound indicator. The fully adjustable temperature control allows you to pre-set the best cooking temperature for your food up to 200 degrees. Enjoy crispy golden-brown fries, snacks, chicken, meat and more, all prepared at the right time and temperature for the best result! High-power Performance for Fast Cooking Results: Easy to Clean and Creates Less Smell than Normal Fryers: The removable nonstick coated drawer and the food basket are dishwasher safe for easy cleaning. 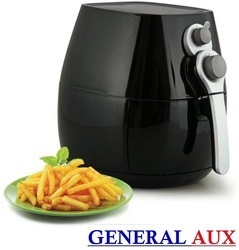 General Aux Airfryer with Rapid Air Technology saves you and your home from the smell of fryed oil compared to a regular fryer. DescriptionWith the price of domestic cooking fuel rising at a rapidly, we must look for alternate ways of cooking to maintain our fuel bills within manageable levels. That, and the increasing search for healthy oil free cooking options, makes the General Aux 12 L BAKE IT EASY Pluto OTG Microwave Oven, from the trusted consumer durable manufacturer, General Aux the perfect solution for you.Designed as a multipurpose microwave oven, the product delivers superior performance in your kitchen and ensures that you get only the best experience when you use it. You can purchase the General Aux 12 Litre 12 L BAKE IT EASY Pluto OTG Microwave Oven Available at the most reasonable prices. Capacity : The General Aux 12 Litre 12 L BAKE IT EASY Pluto OTG Microwave Oven has a capacity of 12 Litres, which is quite adequate for all your microwaving requirements. The spacious aluminium plated interiors, coupled with the overall compact exterior makes the microwave an ideal implement your perfect kitchen. Design : The Microwave Oven comes in an elegant jet black which is sure to add a touch of unmatched elegance to your kitchen. 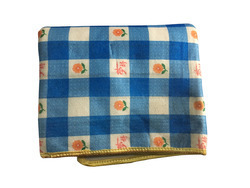 It is easy to clean and maintain, and retains its charm even with the passage of time. There are two knobs in the front panel to help you select the time and temperature for your cooking. The durable dials ensure that you can control all the aspects of your OTG and can use it comfortably for your toasting, baking and grilling needs. 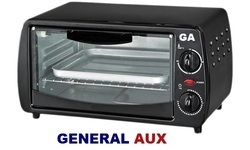 Power levels :The General Aux 12 Litre 12 L BAKE IT EASY Pluto OTG Microwave Oven OTG Microwave Oven operates a rated input of 1000 W, which delivers superior performance in a very power efficient manner. Timer/ClockThe Microwave Oven comes with a timer selection dial for setting the time of cooking. It is easy to operate, and ensures that your food is cooked just right. The 60 minute timer is adequate for all your toasting, baking and grilling needs, delivering delicious food items at your table. Safety Features : The Microwave Oven is designed for extra safety during use. It is safe against electric shocks, and ensures your safety when you are using it in the surroundings of your home. The fireless cooking on the Microwave Oven ensures that you are free from all potential fire hazards and are safe in your kitchen. Convenience Features : The stainless steel inner chamber is easy to clean and maintain. The heat resistant tempered glass window provides a long and uninterrupted service that is unmatched in quality. Maintenance : The General Aux 12 Litre 12 L BAKE IT EASY Pluto OTG Microwave Oven OTG Microwave Oven, with its superior stainless steel cavity, is easy to clean and maintain. This guarantees a long and productive service life. Additional Features : The General Aux 12 Litre 12 L BAKE IT EASY Pluto OTG Microwave Oven comes equipped with a power indicator in front for ease of use and control. It is the ideal solution for all your home baking, toasting and grilling requirements. 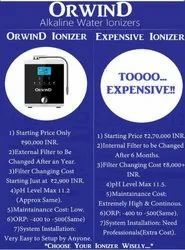 Looking for ORWIND APPLIANCES ?